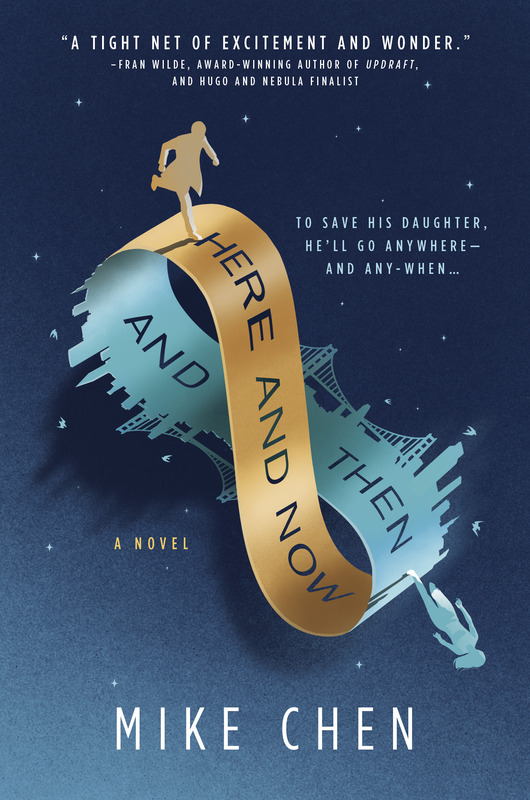 Here and Now and Then by Mike Chen is an epic sci-fi adventure across space and time, as Kin strives to save his daughter’s very existence. Check out our exclusive cover reveal and excerpt now! If you love the intersection between familial relationships, genre-bending sci-fi, and adventures in time travel, then Mike Chen’s debut novel Here and Now and Then is the story for you. Read on for our exclusive reveal of the stunning cover, as well as an excerpt from the novel’s prologue. Kin Stewart is an everyday family man: working in I.T., trying to keep the spark in his marriage, struggling to connect with his teenage daughter, Miranda. But his current life is a far cry from his previous career…as a time-traveling secret agent from 2142. A uniquely emotional genre-bending debut, Here and Now and Then captures the perfect balance of heart, playfulness, and imagination, offering an intimate glimpse into the crevices of a father’s heart, and its capacity to stretch across both space and time to protect the people that mean the most. We couldn’t agree with Chen more. We are obsessed with Chen’s protagonist, Kin, chasing down his daughter, Miranda, along the infinity symbol, which perfectly incorporates the San Francisco skyline. As much as we were anticipating Chen’s debut novel before, we’re even more eagerly anticipating it now. If the cover has you equally excited for Her and Now and Then’s release, we also have an exclusive excerpt of the prologue below to tide you over. No pulse beat beneath the skin. Kin concentrated, waiting for the familiar thump to barely register with his senses. Not his heartbeat, but something equally important: a Temporal Corruption Bureau retrieval beacon, one fine-tuned to his specific biometrics. After twenty-eight assignments over eight years, the implanted beacon’s soft pulse usually faded into the background, another subtlety of time travel that was simply part of the job. Like one’s own heartbeat, it was one of those things that went unnoticed until it vanished. Now it was gone. And with it, his return ticket to 2142. Kin unwrapped the bandage, ignoring the burning pain through his abdomen as he tore the fabric off. His fingers found the dried green edge of binding gel and peeled the adhesion away from the gunshot’s entry point beneath his ribs. He carefully collected any dried gel fragments in a motel towel to be burned later—even in his roughest shape, he always adhered to timeline corruption protocols. No need for nosy 1996 janitorial staff to find future medical tech, even after usage. The bright LED numbers on the wood-trim clock radio across the motel room showed that eight hours and four minutes had passed since his encounter. He could still feel the factory rooftop gravel digging into the back of his neck while wrestling his target, a time-traveling merc who’d been hired to delay a senator’s husband, causing her to miss a vote on a seemingly benign banking regulation that would actually have decades of negative consequences. They’d engaged, his arms and legs locking hers in a vise hold before she managed to grab a brick fragment and smash his kneecap. Now his fingers gripped the bathroom sink’s rim and he steadied himself, his left knee refusing to carry much weight. A brick to the knee and a boot to the ribs. Then a gunshot, not from a plasma discharger but an era-appropriate semiautomatic pistol. The target’s smirk still burned in his memory, the slightest of smiles visible through thin moonlight. For a flash, he’d wondered why she found their encounter amusing, but when the gun’s barrel slid down from his forehead to the implanted retrieval beacon, he knew. Stranding him, it seemed, was a crueler twist than murder. Kin cursed himself for letting her get the better of him, for trusting his gut instead of the endless intel notes provided by the TCB. In case of life-threatening resistance, field agents are authorized to eliminate the target in lieu of apprehension. Kin racked his brain, searching through memories of processes, protocols, and training, anything that might give some insight into what happened when the beacon went offline. But the endless list of technical specifications and fail-safe details offered little comfort, things field agents memorized for no good reason, really. Except there was a good reason: the beacon never went offline. It couldn’t. Not while he was alive. Assess and execute, he told himself. Processes, lists, mental visualization, his mind’s eye sorted it all using years of agent training. Kin’s hand pressed firm against the wound, waiting for the slightest of tremors to register across his palm. Blood oozed out, bright red slipping between his dark brown fingers and running down his shirtless side. One drop hit the bathroom tile of the motel room safe house, then another and another. “Temporal Crimes field agent I-D-R one-five, code E-six, interface active.” The activation phrase given at the end of every mission. Two minutes passed, a hundred and twenty frozen moments. Kin waited, then repeated the activation phrase. One second ticked by, then another and a third. Everything after became a blur; he stared, eyes squinting, awaiting the holographic projection with tactile interface, what always appeared when he said the activation phrase. He could see the holo now: the blue-and-orange semitransparent lines with a simple input/output display floating a few inches from his face. He could feel the tactile thump response of the virtual keyboard while entering in mission status codes and confirmation thumbprint signature. But only in his head. No holo interface, no ability for end-of-mission transmission to the Mission Control war room. Kin grabbed a small black rectangle from his first-aid kit. “Vital measurement scan,” he said, and a hologram of letters and numbers floated in front of him, broadcasting his body temperature (slightly elevated due to injury), heart rate (same), hydration level (dehydrated), respiratory rate (normal), and blood pressure (steady). All of that should have coordinated with the beacon to confirm his identity and fuel its thermal-generated power source. A thin black stick popped out of the device with a quick hydraulic hiss. He gripped the plasma scalpel, palm wrapped around the cylinder so tight that his hand throbbed. Two inches above the gunshot wound. Then a diagonal line about eight inches down, held at a slight angle inward. In theory, if the beacon had even a flick of power coursing through it, removing it would fire an emergency retrieval signal to a Mission Control tracking system in 2142 as its final shutdown act, a trigger upon exposure to raw air. Kin ignited the scalpel, the stench of burning flesh harsher than the gradual burn into his skin. But if the beacon was totally dead, he’d have a gaping wound on top of his existing injuries. Not ideal conditions for patching up ad hoc surgery, especially with a lack of basic medical supplies. The scalpel retracted its thin beam of heat. Towel. Water. Pressure. Binding gel. For now, he bandaged the wound while considering the next logical step. Two more days in 1996 until the end of his two-week mission span, two more days in 2142 before Mission Control scanned for a retrieval signal. Normally, he appreciated the TCB’s strict scheduling, a one-for-one policy that prevented field agents from appearing to age at an accelerated rate. Now that just meant two more days of asking what-ifs. That had to be it. They wouldn’t leave him here. His wound bound and cleaned, Kin sank his naked back against the bathroom wall. He slid down and let out a breath, an oppressive weight collapsing down on his chest. A new option appeared in his mind, the only one left: stay calm, wait, and see. An unknown future. The thought gripped every muscle in his body. Kin’s groan echoed off the thin, dirty walls of the motel bathroom, and though this room had harsh lighting, his eye caught something behind the toilet. Despite the burn in his side and stinging in his knees, Kin reached, gut cramping from the wound, and he slid the object into view while fighting off the slight tremble taking over his hand. A quiet laugh fought past the pain spidering throughout his battered body, past the fears he didn’t want to acknowledge. The most worthless piece of physical currency in 1996. Or a sign of something else. He grasped the coin, his fingers curled into a fist, pressing so hard the edges dug into his skin. A calm came over him, his breath returning to normal and his heartbeat slowing to a regular rhythm. It had to be something, this one little sign of his past—or his future, depending on perspective. Hope. Of course. What else would a penny be to him? You can pre-order your copy of Here and Now and Then at the links below, and be sure to add it to your Goodreads to-read list.